It appears that the 3-minute cooldown on regular Plunder Skulls has been removed for the 2018 festival for most sources of regular Plunder Skulls. For the most part, the on-screen timer can be ignored. The 2018 festival also introduces the new Dremora Plunder Skulls, which appear to be on a 20-hour cooldown from the previous skull of that type that was looted. The /pstdremora command was added to support this. Typing the /pstdremora command into chat will print to your chatbox a log of the Dremora Plunder Skulls that you have looted and when each was looted, to help with managing the eligibility cooldowns on these skulls. You can also include an optional filter term; e.g., if you type /pstdremora tri, it will show only the skulls whose names contain "tri" (i.e., the Trial skulls); typing /pstdremora without a filter term will show the full unfiltered log. What is the Plunder Skull Timer and what does it do? This simple addon displays the amount of time that has elapsed since the last time you looted a Plunder Skull. Since the Plunder Skulls from the Witches Festival appear have an internal drop cooldown, it's useful to see how long it's been since your last loot. Just install the addon! The timer will automatically appear when you loot a Plunder Skull, and the timer will automatically reset when you loot another Plunder Skull. If you haven't looted a Plunder Skull in a long time (over 15 minutes), the timer will automatically stop and hide itself. Once the timer appears, you can reposition it by using your mouse to drag it around. You can manually hide the timer by double-clicking on it. You can disable the auto-hide feature (so that the timer will run indefinitely) by typing the /pstautohide command into chat. How long is the cooldown on Plunder Skulls? 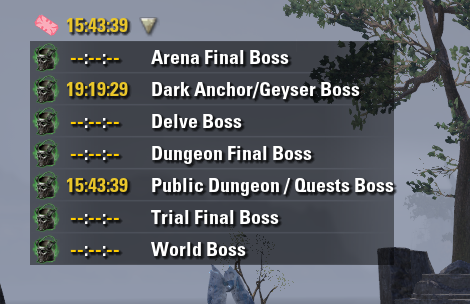 Based on my testing, the cooldown is exactly 3 minutes for bosses in group dungeons. I think it's safe to assume that the same cooldown applies to other instanced content, such as trials and arenas. It's been reported that public dungeon bosses also share the same 3-minute cooldown. Reports on the forums suggest that the cooldown is higher for overland and delve bosses, but I have not tested this to confirm nor do I know what their cooldowns are. It will disappear if you reload UI or if 15 minutes have passed without looting a skull. It will reappear the next time you loot a skull. This is intended. Liking that it now shows the server. I've been grabbing tickets on both servers across two accounts, and it was kinda wonky. It'd be nice if it also tracked ticket pickups, but, even without that, it's still very nice. Good work. This lets me see what I have done recently and what recently came off cooldown, across three different accounts that I play. Is it the most efficient and friendly display? Of course not. But I don't care--it's something that I'll use for two weeks and never touch again for a year, which doesn't exactly incentivize me to invest any time to do anything other than a quick-and-easy solution of dumping a log to chat. You are certainly free to write your own addon, of course. I simply have no incentive to do anything that would take more than 10 minutes to implement. Sorry if my comment sounded meanie! Sadly I lack any skill to write addons haha, I agree that this won't be used for long but it may be used by many for countless houers during the event. Anyways thanks for the addon! Heya! Loving this /pstdremora addition to this but I'm wondering if this is a known issue? I've been doing it on multiple toons so I'm wondering if that's why it's doubling up? It's not a doubling up--the log is pretty primitive (I spent at most 15 minutes on it :P), so it just displays everything. You're looking at two days worth of skulls. The only ones that you need to pay attention to to are the red ones at the bottom of the list, because those are all the ones that are on cooldown. All the green entries above that (and there will be many, many more as the event goes on) are really just there for your records. Don't see a need for the green text list then?! Last edited by Tonyleila : 10/21/18 at 08:17 PM. Makes sense about only needing to worry about the red entries on cool down Thanks for this awesome add-on, again! Last edited by fgoron2000 : 10/20/18 at 05:17 PM. Last edited by Marazota : 10/20/18 at 05:16 PM. I just killed two bosses in the Rivenspire public dungeon, about 30s apart, got two skulls. There is no cooldown, unless, as I wrote in my previous post, it's the same boss respawning faster than usual. Hmm, that's very strange. Maybe it's different from dungeon to dungeon? In the Rivenspire dungeon, I got a skull from every boss. 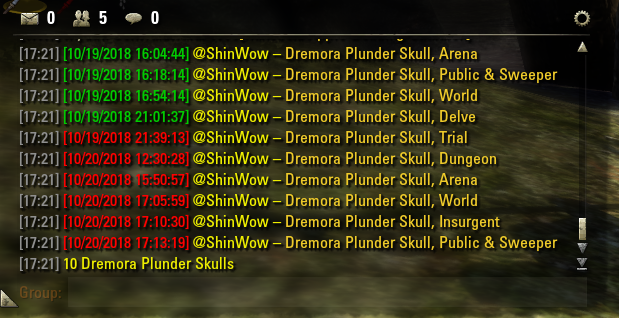 Yeah, delves are still 4 minutes between Plunder Skulls, just like last year. I have not had time to check others. Hi there, nice addon, really usefull. But after today's update is not working anymore. The dremora skulls from today don't update the timer. It is still showing times from before the update.